Simpsons Removals was established nearly 40 years ago and has grown over the years into one of the leading removal companies in the UK. For all home removals, business removals and relocation services throughout the UK, Europe and the developed world, the professional moving team at Simpsons can help. Our experienced staff are experts in shipping personal possessions safely and carefully to new destinations around the world, so, if you’re in need of a reliable and trustworthy removals company to move you from home to home, we’re here for you. Simpsons provide transport throughout the UK, anywhere in Europe and cover all of the popular destinations worldwide, as well as some of the more remote areas of the globe. Simpsons will collect, deliver, store your goods, send excess baggage, provide packing materials, assist you with your home move or relocate your business for you. No matter what type of moving service you are looking for, our removals team can look after you. To find out more about our shipping, storage or removals services simply browse through our website. If you have any queries you can contact us via our online form, or call us free on 0800 515930. Whether you are moving just a few streets away, or from one end of the UK to the other, count on Simpsons for a professional, efficient and well organised removal service. You will have the peace of mind of seeing your goods loaded safely, and leave to travel directly to your new home – allowing you to see the vehicle arriving and unloaded. With nearly 40 years experience in the International removals arena Simpsons are well placed to offer clients a comprehensive & professional overseas moving service by sea or air. 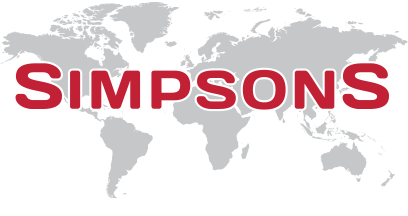 Simpsons provide both export & import services to trade clients. Exports incorporate the major European & International destinations & imports are delivered throughout the UK & Europe. I thought I’d write to say thank you for the service. Appreciate the dialogue throughout and the flexibility to ensure my delivery arrived on my requested date. The delivery guys were actually early. It really helped to ensure my move went very smoothly. I’d happily recommend using Simpsons to others. Overall, Simpsons were very professional and completed the whole move in a timely manner. The removal team were polite and willing to help out with dismantling furniture and providing advice on packing. we didnt feel rushed or pressured at all even though the clock was ticking. Get a FREE Quote From CountryUnited KingdomAustraliaAustriaBahrainBelgiumCanadaCyprusCzech RepublicDenmarkFinlandFranceGermanyHong KongHungaryIndiaIrelandItalyKuwaitLuxembourgMaltaNetherlandsNew ZealandNorwayOmanPortugalQatarSaudi ArabiaSingaporeSlovakiaSloveniaSouth AfricaSpainSwedenSwitzerlandThailandTurkeyU.A.E.U.S.A. To CountryUnited KingdomAustraliaAustriaBahrainBelgiumCanadaCyprusCzech RepublicDenmarkFinlandFranceGermanyHong KongHungaryIndiaIrelandItalyKuwaitLuxembourgMaltaNetherlandsNew ZealandNorwayOmanPortugalQatarSaudi ArabiaSingaporeSlovakiaSloveniaSouth AfricaSpainSwedenSwitzerlandThailandTurkeyU.A.E.U.S.A. The personal data we collect from you will only be used for the following purposes: 1) To prepare a quotation for a removal or removal related service from your home. 2) To phone or email you to determine your precise service requirements. 3) To follow up our quotation within a reasonable timeframe. 4) If you move with Simpsons Removals, to allow us to contact you after your move if we require additional information to permit us to fulfill our contract with you. By consenting to this, you are giving us permission to perform these actions. You may withdraw consent at any time by email or by completing the contact form on our website. Ticking this checkbox confirms that you consent to providing us with your personal data.